- Tangled Threads -: So much for plans! I had intended to write last weeks post in advance and have google work it's magic and schedule the post to appear while I was having surgery....unfortunately, life got in the way and I didn't manage to write anything! Ah, the best laid plans and all that. So after surgery, my doctor told me to 'take it easy and rest up'...well of course, translated into English, that means don't do any housework and just sit and stitch......wouldn't you agree? I had cooked some meals and popped them in the freezer so that I could have more time stitching recuperate without worrying about meals. Unfortunately for me, I couldn't get comfortable at all to stitch! My leg was bandaged and I couldn't bend it and no matter what way I tried to sit or lie it wasn't conducive to stitching! 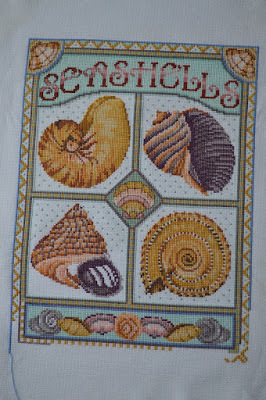 ...yes, I finally made a concerted effort to finish the last of the large seashells. 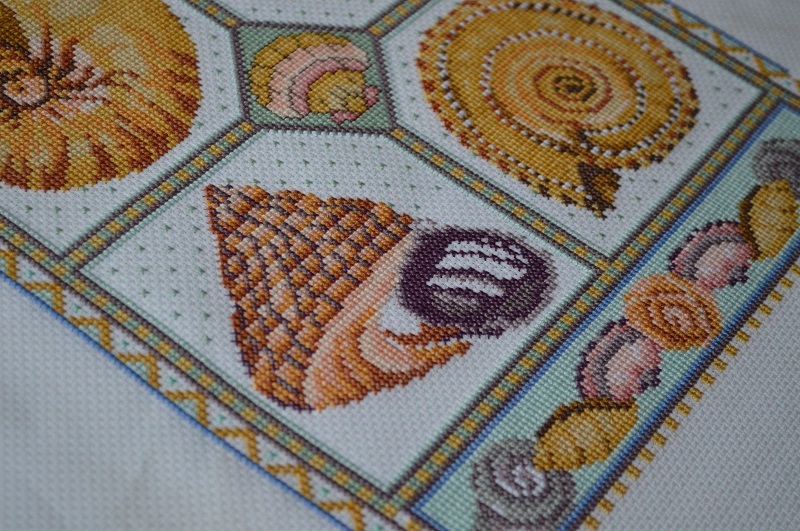 Unfortunately it did involve some reverse stitching :) but the last bit of stitching to be done on it is quite simple and shouldn't take too long. So now all that's left is the last bit of the border and then allllll of the back stitching. Now I'm kicking myself (but very gently as my leg still hurts!) for not doing more of it as I completed each section. Yes, this is how my hubby motivates his staff :) Actually, it's for when their projects aren't working and it's a funny way for them to ask for help. So when your project isn't working out, you put this up (it's framed, but I didn't take a picture) and others can help and lend support. They all thought it was funny, so I guess it must be working. I never, ever thought I'd be stitching a smiley pooh! The end is so close on those seashells! And I love the poo! You’ve done really well with Seashells! Clever idea from Hubbie! 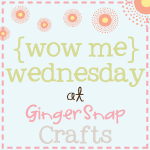 Who knows what you’ll stitch next! The shell design is just beautiful every time I see it. You will be happy dancing soon...be careful with your leg though. I agree about the doctor orders. Sounds clear to me. I love the poo. I think you should sell the chart. I know my son would love it. I do hope you get better soon! 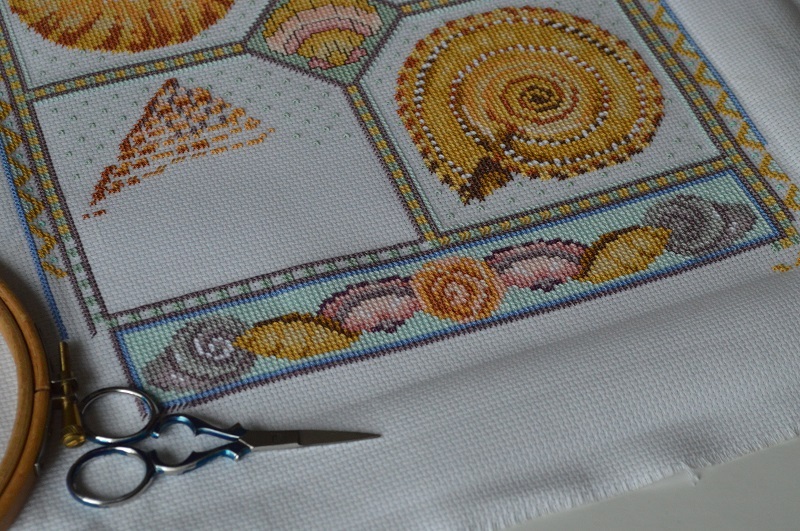 There’s nothing worse than not being able to stitch when you want to! Your sea shells are really lovely, it’s such a beautiful design. 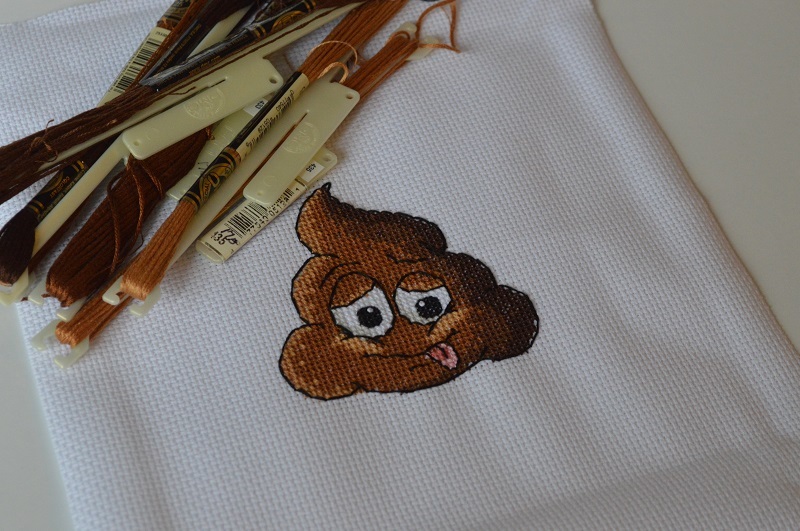 And I’m not sure I’d have ever thought of motivating my staff that way, let alone stitching the smiley poo, but whatever works I guess! le conchiglie sono sempre più belle! Forte tuo marito! I hope you've found a comfortable position by now! The seashells look great, hopefully the back stitching won't take you too long. What a fun thing to stitch for your hubby! That would have been perfect for the Sludge Buddy team last year in Lego League!